We’d love your help. 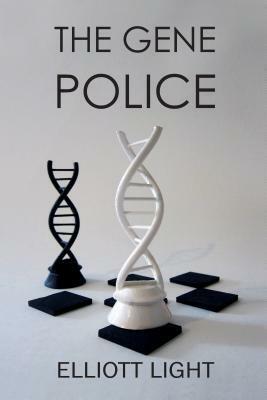 Let us know what’s wrong with this preview of The Gene Police by Elliott Light. To ask other readers questions about The Gene Police, please sign up. Too many characters, messy plot line, not feeling it. Super nice author with a really interesting bio! I wish he would write a memoir instead. I would really like to write a great review for this book as I really enjoyed it. However I don't seem to have the writing talent that Elliott Light has, so I will just say a few things. I liked the way the murder investigation is intertwined with the pseudo science of Eugenics. Light seems to be good at this sort of thing. Plus it has lots of cats which is a real winner for me. I became interested in reviewing this book due to some prior knowledge of the eugenics movement. The author Elliot D. Light does an astounding job of bringing the reality of this destructive, shabby, non-science to the minds of the reader. Set in the style of a mystery read, the beginning takes off with more questions to the reader than ever. I felt compelled to continuing diving into this read. Not only that but Light helps the reader to understand the racial dynamics of the past. In light of u I became interested in reviewing this book due to some prior knowledge of the eugenics movement. The author Elliot D. Light does an astounding job of bringing the reality of this destructive, shabby, non-science to the minds of the reader. Set in the style of a mystery read, the beginning takes off with more questions to the reader than ever. I felt compelled to continuing diving into this read. Not only that but Light helps the reader to understand the racial dynamics of the past. In light of understanding the racial dynamics in the United States in the 1950's, this book also helps spread justice to racial destruction in today's world too. I thoroughly enjoyed this read and do recommend any of you out there that wants to turn fast pages and have inquiring minds to pick this one up. I really liked the fact that everything started out as a mystery that I just had to solve! I really look forward to other works written by Light. Shep Harrington is back in the third installment of Elliott Light’s novels, this time Shep takes a stab at the world of eugenics, which is breeding to create the ultimate human, a person with the most desirable qualities, created in a lab. In The Gene Police, we are taken back in time where we meet Carl and Betty who are sterilized after the death of their newborn baby. When, fifty years later, the DNA of that dead baby is found at a murder scene, things get a little tricky. Was that baby actuall Shep Harrington is back in the third installment of Elliott Light’s novels, this time Shep takes a stab at the world of eugenics, which is breeding to create the ultimate human, a person with the most desirable qualities, created in a lab. In The Gene Police, we are taken back in time where we meet Carl and Betty who are sterilized after the death of their newborn baby. When, fifty years later, the DNA of that dead baby is found at a murder scene, things get a little tricky. Was that baby actually dead, and why were Carl and Betty sterilized? With the help of Betty’s nephew, the answers may not be as far away as they once thought. Shep is the one who can find the answers, if anyone can. Elliott Light has a way of creating characters that pop off the pages, and this book will have you immersed from the very first page. Shep is a kind hearted character, he’s seen a lot of stuff in his life, and there is never a dull moment with him. This is one of those books that has quite a few different plot lines, but they all come together in the end. “The brutal murder of Jennifer Rice. The evidence: DNA found at the scene, DNA that belongs to a man long thought dead, and a shadowy fifty-year old photograph of a woman holding a baby taken at a near-by farm. Shep Harrington is drawn into this legal quagmire by the arrival of his friend, and now client, Reggie Mason, a black state trooper, who admits that he obtained the DNA illegally. All Reggie wants Shep to do is to ask former residents of the farm it they remember anyone taking pictures or if they saw a woman with a baby. But simple requests are not easily contained. As Shep soon learns, the request brings him to the top of a slippery slope with an ill-defined edge. Question begets question, and the slide down the slope proves inevitable: What happened to the baby? Who is in the photograph? And who killed Jennifer Rice? 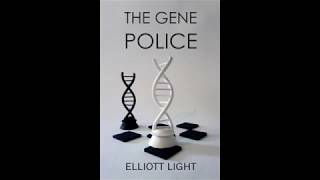 The Gene Police by Elliott Light is a well-crafted story with a complex plot that brings to light a harsh reality many American’s probably won’t relish taking a closer look at. I’m not going to tell you what that reality is... you will have to read the book for yourself to understand what I am talking about, but I will say that I couldn’t help but nod my head in agreement with Mr. Light this morning when I realized he had a very valid point involving “eugenics”. If you aren’t familiar with that term right now, you will be by the end of this book. His dedication at the beginning of the story certainly hints at what is to come. As you read, or listen to the book...whichever method you choose. Try to remember that much of what Mr. Light discusses actually happened here in the United States. It is a part of our American History, a part of what contributed to the Holocaust, a contributing factor to our chaotic political environment and in that sense it is a part of our present as well. The main character, Shep Harrington is a good man with a troubled past who just seems to continually be drawn into situations he really should steer clear of. This he and his law partner Robbie are asked by a friend to look into who took some old photographs. They agree and a twisted and gnarled plot begins to open up, leading the reader into a dark and gruesome past; a past that has been buried for 50 years and one that many want to remain buried. Shep, is a complicated man. He’s been on both sides of the law. He also recently inherited a ton of money from his estranged father and could live very well off of it, yet instead he chooses to live in a run-down house rather than the mansion on his property where his elderly “residents” live. He could do anything, live anywhere...instead he has his sights set on re-opening a Poor Farm to help others. His willingness to help others along with his simple lifestyle are probably the only thing that saves him when the Tax Man comes calling with a bill of $750,000 in unpaid taxes....courtesy of his now deceased famous father. What’s not to like about a character like that? Shep sees himself as a dark and troubled man and yes he has a complicated past. However he doesn’t turn anyone away who is in need of assistance...that makes him complex true, but I don’t quite feel his darkness perhaps that’s more apparent in the previous books in this series. Instead I get more of a feel for his generosity and good heart. Oh, and Shep has cats...lots of cats; just a few more creatures in need of help that he doesn’t turn away. These critters end up being a fun addition to the book too. I don’t say that just because I love cats (don’t judge me) but because they become tertiary characters due to how Mr. Light treats them. He does the same with the house Shep initially lives in at the beginning of the book, that too becomes a character in and of itself and becomes an integral to the plot at the end of the story. As to the pace of this story, I really liked that. It rolls along at a steady pace, keeping the reader wanting to see what happens next and never losing the reader’s attention during the parts with less action. Not once did I find my mind wandering or wonder when the pace would pick up. The resolution to the story was also very clever, I loved. No, I’m not going to elude to what it was...but it was clever. If I had to pick something to criticize it would be this, character names. Yeah, I know I’m a picky picky bugger but it is something that came to my attention. In this story we have two pretty important characters named Robbie and Reggie. Now, this may seem silly to bring up since one is a female lawyer and a potential love interest and the other is a male State Trooper but the names being so similar kept giving me slight pause. That’s a minor thing to point out and I’m not sure I even truly realized it was an issue until I sat down to write this review and found that I kept trying to call Robbie....Reggie in my mind when I would go back over the story in my head. Over all though, I really loved this story and give it 4.5 out of 5 Stars. Would I recommend it? Oh heck yeah! Go get a copy for yourself; you’ll be glad you did! As always, let me know what you think of the story too, I’d love to talk about it! I love this cover! It’s bold and simple at the same time...very effective at drawing the eye throughout the entire cover. This cover proves you don’t have to get fancy with the fonts either. Clean, crisp and well-spaced can be much more effective (as it is here) than fancy, bold, in-your-face lettering. Well done to the graphic artist on this cover! I also love the lack of color providing a symbolic hint to what is contained within the story, way to go! This was a Goodreads win. I gave this one to my mom to read. She said it was really good. Mom told me that she would love to read more of his books. Ah, the long-winded opening that presents the life history of the protagonist. It seems that no matter how many times you scream the advice to not do this, writers still do. Given, the opening of this book is not the worst I've read. It's still a bit long-winded and had me asking the question, "Why do I need to know this right now?" The beginning felt like the protagonist (Shep) was recalling a previous book for the reader's insight, read in a "this happened, this happened, then this happened," Ah, the long-winded opening that presents the life history of the protagonist. It seems that no matter how many times you scream the advice to not do this, writers still do. Given, the opening of this book is not the worst I've read. It's still a bit long-winded and had me asking the question, "Why do I need to know this right now?" The beginning felt like the protagonist (Shep) was recalling a previous book for the reader's insight, read in a "this happened, this happened, then this happened," kind of voice. This book wasn't bad, but it wasn't for me. I'm not a big fan of murder mysteries to begin with. I often get bored - I like character driven, not plot driven. I couldn't get into Shep. There was this distance between us. It's the same distance I feel with a lot of murder mystery protagonists - it's like they are a faceless figure that I'm supposed to step into. This book did that thing were the characters would be talking about something without supportive narration for the reader. If I knew more about legal aspects and how attorneys work, I might have followed along better. But I don't. So I didn't. But, if you're into murder mysteries, this book is worth a look. Overall, I give The Gene Police a 3 out of 5. I enjoyed reading Gene Police. At no time did I find myself thinking 'this is boring!' or 'this is dragging on!' The story didn't drag its feet at the start like some books do, it grabbed my interest quickly. It is a compelling read. I liked the development of the main character Shep and his close friend Robbie. There are many characters and some are intricate, therefore this isn't a quick read. Rather a book that needs, and deserves full concentration. The story is complex and isn't the type of I enjoyed reading Gene Police. At no time did I find myself thinking 'this is boring!' or 'this is dragging on!' The story didn't drag its feet at the start like some books do, it grabbed my interest quickly. It is a compelling read. I liked the development of the main character Shep and his close friend Robbie. There are many characters and some are intricate, therefore this isn't a quick read. Rather a book that needs, and deserves full concentration. The story is complex and isn't the type of novel that you can skim through, you really need to read and understand what is happening to grasp the story. The history surrounding Eugenics and white supremacy was fascinating and added complexity and significance to the story. The editing is satisfactory, as well is the grammar. My only suggestion would be that as there are many characters in the book, occasionally I got a little lost with the similar character names, and with what position they played in the story at that time. Overall I rate this book 4/5. My thanks to the author and Sage from the Reading Room for a copy of Gene Police in return for my review. Really enjoyed reading The Gene Police and my favorite character Shep Harrington. Without giving too much away here. The information Elliot Light shared was very interesting as I was pulled in more with each page. Things most of us don’t think about. Every character led the way to want to know more about them and what their future holds. A must read! I am a retired patent attorney living in Florida with my wife Sonya and our feline, Tsuki. I spent most of my life in the Washington, D.C. area. I grew up in McLean, Virginia before the beltway was constructed. Some of my classmates in grade school lived on nearby farms. McLean had a small town feel to it. Gossip spread without the Internet. Party lines were common. Secrets were hard to keep. When I am a retired patent attorney living in Florida with my wife Sonya and our feline, Tsuki. I spent most of my life in the Washington, D.C. area. I grew up in McLean, Virginia before the beltway was constructed. Some of my classmates in grade school lived on nearby farms. ​McLean had a small town feel to it. Gossip spread without the Internet. Party lines were common. Secrets were hard to keep. ​When I was in my early thirties, my life pivoted when I was accused of a crime I didn't commit. My defense counsel and I discussed plans for my likely indictment and possible imprisonment. I could expect to be handcuffed and paraded in front of the media. This experience with the so-called justice system ended after a two year ordeal when I was cleared of wrongdoing. No indictment. No trial. Even so, it could have ended differently. The Shep Harrington SmallTown® Mystery series began with the publication of ​Lonesome Song in 2002. Before writing Lonesome Song, I was intent on writing action-spy stories. In 1990, I read "The Last Poorhouse In Virginia; An Era's End at the Place Where No One Was Meant to Stay," a story article written by Jim Naughton and published in the Washington Post. The story chronicled the lives of the residents of what had been a poor farm, a place where the unemployed and unemployable were sent to trade work for food. As I chased dreams of writing the next Clancy thriller, the story of the last remaining residents of the Shenandoah County facility continued to haunt me. ​I grew up visiting old plantations where my mother's relatives once lived. As a child, I didn't fully appreciate the history of these places or the people I met there. But the experiences were imprinted on my memory. The poor farm in Mr. Naughton's article fused with these memories. I was teased by questions about who might have lived on a poor farm, how they might have arrived there and what was going to happen to them. Ultimately, spies gave way to a story about a small town, a once famous country singer, a collection of old forgotten poor farm residents, and a murder. Shep Harrington, a young disbarred attorney, entered the mix and the story almost wrote itself.